Congratulations to the following people who were presented stripes last night. DY Wee - moving up to White belt with 2 stripes. Tim Vermuleun - moving up to White belt with 2 stripes. Ryan Mazengarb - moving up to Purple belt with 3 stripes. Hobart Martial Arts Academy played host to a triple grading on Saturday the 12th of May with over 40 students and friends getting together to celebrate the promotions. Calum Young and Billy Burton were both presented their well earned Purple Belts and Dan Brown made the step to Blue Belt. Billy Burton receives his LONG overdue purple belt from Gerry Young and Adam Newton, Billy was Tasmania's third Blue Belt and is well deserving of his new rank. 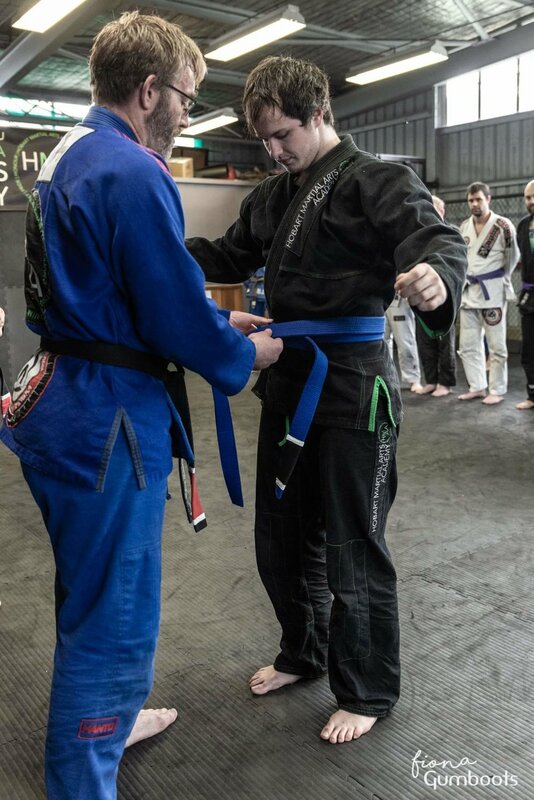 Dan Brown receives his Blue Belt from Gerry Young, Dan is an excellent example of hard work and dedication, congratulations Dan. Always smiling and always ready for a challenge, Calum exemplifies hard work and is absolutely deserving of his new rank of Purple Belt. Hobart Martial Arts Academy will once again be hosting Craig Jones for a seminar, don't miss the chance to train with such a seasoned competitor. Details Below. Dahlia Foo is one of the most exceptional people I have ever met. She is hard working, dedicated and commited to her values. She shows intellect and creativity in her studies and her training. Dahlia's commitment to her studies keep her in the field (and out of the gym) for long periods at a time, but despite that her promotion to Blue Belt is long overdue. Congratulations Dahlia, you are an inspiration! On Saturday the 15th of October Gerry Young of Hobart Martial Arts Academy was promoted to Black Belt in Brazilian Jiu Jitsu by his coaches Thiago Stefanutti and Adam Newton. Gerry completed three hours of straight grappling with all of his students and training partners as part of this process. Thanks to everyone for sharing in what was as much a group achievement as an individual one. Hobart Martial Arts Academy student Huan Wen Wong has put in the hard work for several years now and has worked his up to the level of Blue Belt. Despite being the smallest guy on the mat and being very busy with full time University studies, Wong has still managed to put the time in on the mat and to even supplement his training with Judo. The epitome of hard work and dedication, it is an absolute pleasure to promote Wong! Following her amazing performance at the 2016 Tasmanian State Championships Hobart Martial Arts Academy's Carla Johnson was featured in the Tasmaniam Times. I have written a post as a wrap up to the Legion Muay Thai and Grappling show from the 24th of April. Check it out here.